January 1995 marked a seminal moment in modern Antarctic history, with the crumbling of the Larsen A ice shelf, a floating plain of ice fed by glaciers on the Antarctic Peninsula. Less than a decade later, its southern neighbor, the Larsen B ice shelf, disintegrated, stunning polar scientists. After the spectacular collapses of Larsen A and B, scientists began keeping a close watch on the next ice shelf to the south, the Larsen C, which has shown some worrying signs of thinning. At about the area of Scotland, it is five times larger than the Larsen B (itself five times as large as the Larsen A), “so when Larsen C goes, it’s going to be a really big event,” Paul Holland, a researcher with the British Antarctic Survey, said. The failure of the Larsen C would mean that Antarctica’s contribution to sea level rise would increase, further imperiling Earth’s built-up coastlines. The loss of the Larsen A and B ice shelves caused the glaciers behind them to speed their flow to the sea, contributing to the rise of global sea levels that are already threatening the the more than 1 billion people that live along coastlines. 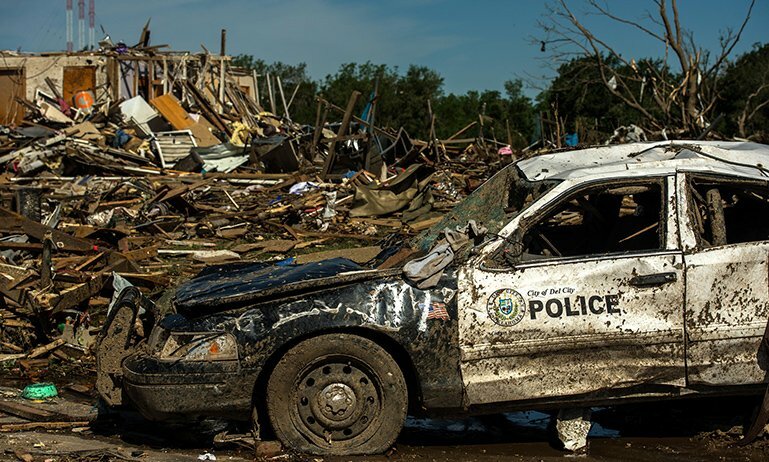 Since the beginning of the 20th century, global sea levels have risen by 8 inches, making storm surges during events like Hurricane Sandy higher and more destructive than they once were and causing more regular minor floods in coastal areas. The most recent Intergovernmental Panel on Climate Change report estimates global sea levels could rise by between 10 and 39 inches by 2100. 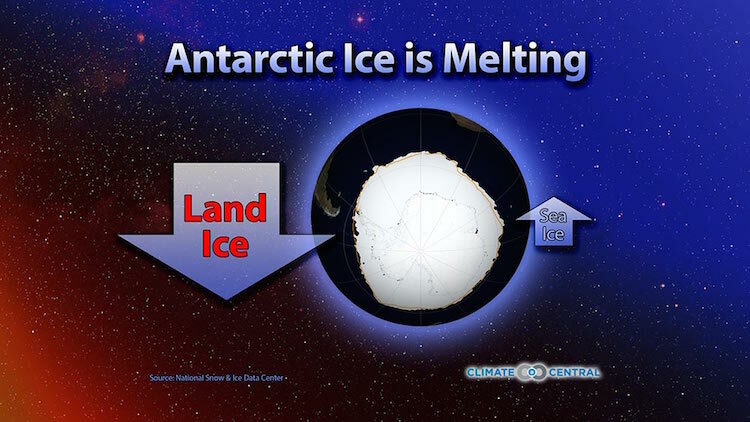 The IPCC estimates that Antarctica’s current contribution to that rise is about one one-hundredth of an inch a year. 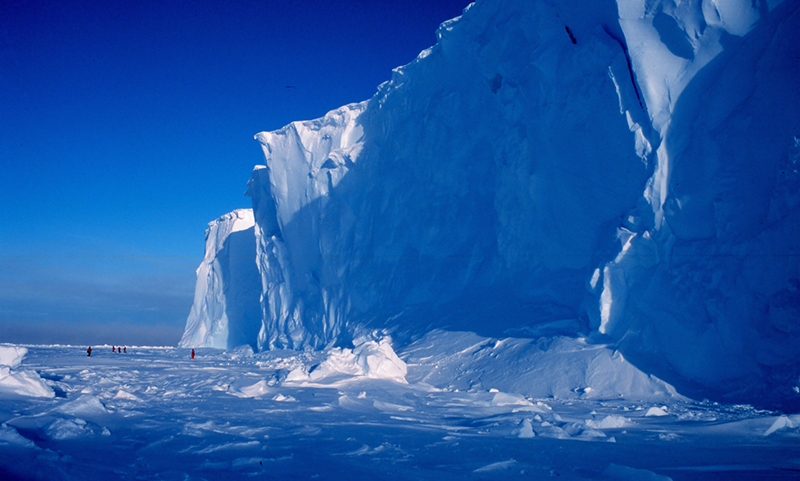 The collapse of Larsen B ice shelf in early 2002. One key question Antarctic scientists have been trying to answer is what exactly is happening to the Larsen C: Are warm waters melting it from below, or is warming air melting it from above? A new study from Holland and his colleagues, detailed in the journal The Cryosphere, suggests it could be both. Lots of ice shelves all around Antarctica have been shrinking in recent years, and doing so at an increasing rate, as recent research has shown. Most of these are being eaten away from below, as warm ocean waters invade and lap away at the ice. Air temperatures, while warming, are still too cold to cause much surface melt across much of the continent. But on the Antarctic Peninsula — the arm that stretches northward from the continent toward South America — rising air temperatures are impacting the ice. 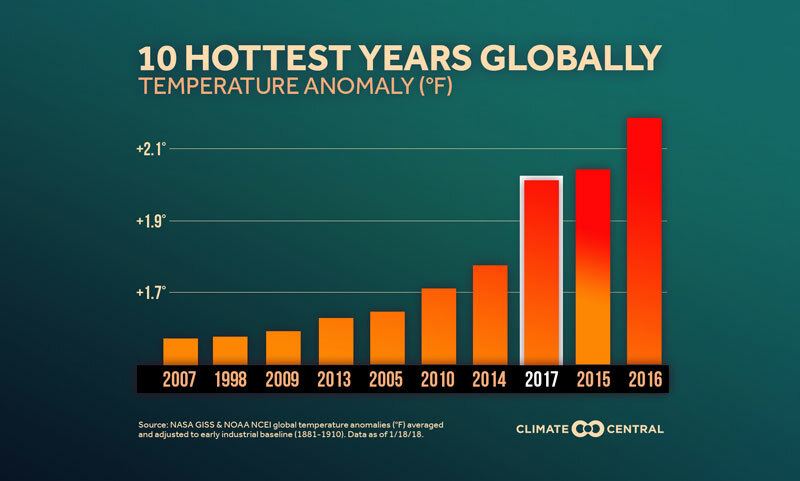 The region is a global hotspot for warming, with temperatures that have risen by about 5°F in the past 50 years, while the globe as a whole has warmed by about 1.3°F. A study published last year pointed the finger at this warming as the reason for the Larsen B collapse, arguing that the elevated temperatures caused excessive surface melt that led to significant cracks in the ice. When it comes to the Larsen C shelf, both warming air and melting ice are potential culprits. The surface of the ice shelf has been getting lower and lower in recent decades, but it was unclear what the source of that lowering was. It could be that the layer of compacted snow at the surface, called firn, was melting and compacting further still, or it could be that ice from the bottom of the shelf was melting, causing the height of the glacier to adjust. Or it could be some combination of the two. That’s what Holland and his colleagues set out to tease apart with their research. 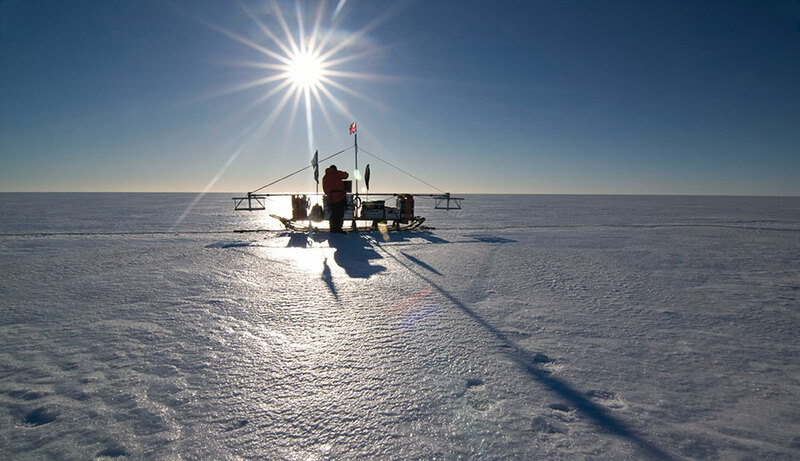 To do this, they stitched together data from eight different radar surveys, some conducted by airplane and others done by dragging the equipment across the ice. The radar can penetrate the layers of ice to show how thick both the firn layer and the shelf as a whole are. One of the sleds that scientists used to drag radar instruments across the Larsen C ice shelf. What they found was that the ice shelf was indeed losing ice, and that the firn layer was shrinking. “The fact that it’s sort of being attacked by both does make it unique,” Holland said. What exactly is causing the ice loss and firn compaction is still not fully known. It’s possible the firn is melting and compacting because of warmer air, or it could simply be that less snow is falling to build it up. For the ice loss, which is the larger force affecting the shelf, it could be that the ocean waters are melting the ice, or that the flow of the ice is changing. 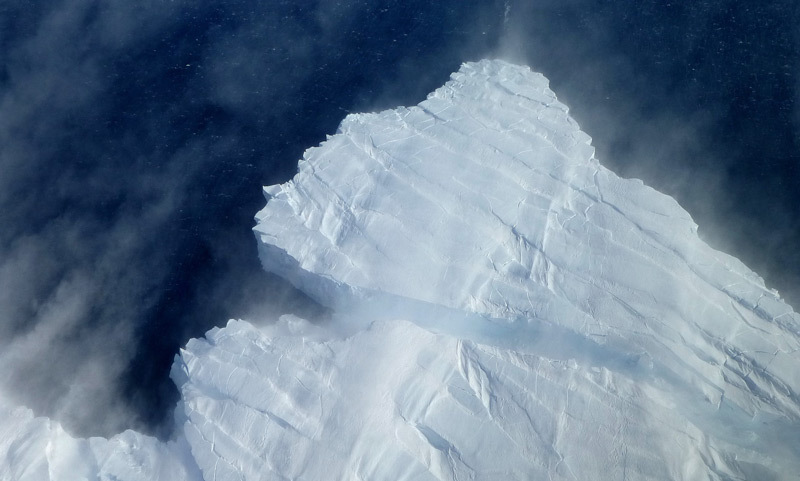 Ted Scambos, a researcher with the U.S. National Snow and Ice Data Center in Boulder, Colo., said that the new study did a good job of separating the potential influences on the ice shelf and backs up what others have long suspected was happening in the region. Scambos was not involved with the study. The 1-2 punch to the Larsen C makes the ice shelf more vulnerable, particularly with some other worrying signs. 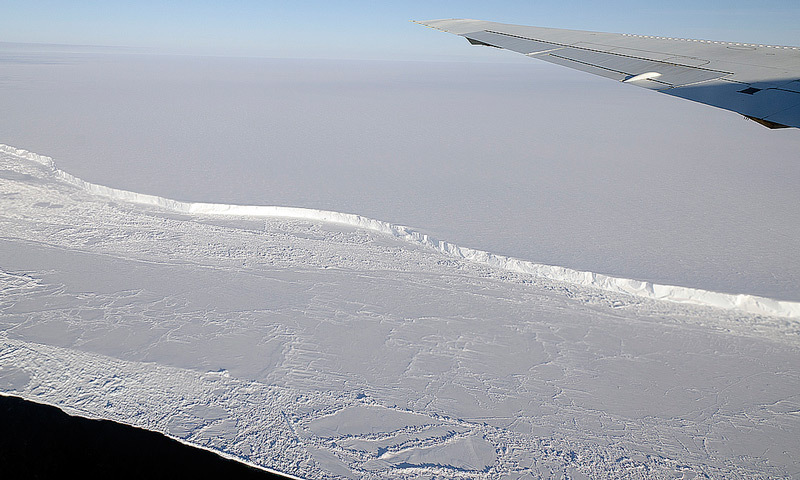 The biggest threats to the ice shelf’s stability, Holland thinks, come from indications it could unpin itself from an island that helps slow its flow, as well as a rift that has formed across the ice. If that rift reaches more vulnerable parts of the ice sheet, it could seriously destabilize it. “That’s a thing we need to keep an eye on,” Holland said. Editor's note: This story was updated to correct the contribution from Antarctica to global sea level rise. This originally appeared on Climate Central. 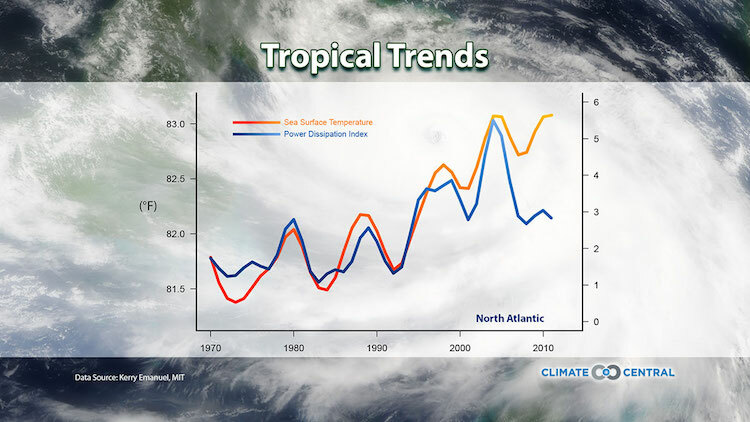 Is Warming Changing Boundaries of Hurricane Season? September marks the end of winter when the sea ice that surrounds Antarctica swells to its maximum extent.